Summary: This is book 3 of the Starbound trilogy. Unfortunately, I read the first two before I started book-blogging, so I don't have any previous reviews to link you to, but suffice it to say that I gave each of the two previous installments five stars as well, so full disclosure: I LOVE this series. Starbound features three books, each one about a different couple, but they are all sequential and take place in the same universe. Their stories are connected, and if you go back and look, you'll see that the later characters were mentioned in earlier books, and earlier characters make appearances in later books. 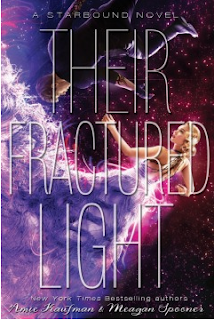 These Broken Stars kicks off the series, with Tarver Merendsen and Lilac LaRoux. He is a jaded soldier on a victory tour onboard the luxury spaceliner Icarus, and she is the daughter of the most powerful man in the universe, Roderick LaRoux of LaRoux Industries; the Icarus is Daddy's ship. Suddenly, the Icarus crashes down on a strange planet, and they find themselves having to survive not just the elements, but the strange whispering voices and apparitions that begin to appear. This book really made me cry, by the way. Thoughts: So, as I said earlier, I LOVE LOVE LOVE this series, so I was very excited for this third book to come out, and holy crap, it did NOT disappoint. The last third (?) or so of the book had all six main characters thrown together, having to work together, and it was pretty great. In fact, this particular book felt more action packed, with the characters constantly on the run or in hiding, so it was tense all the way through. I could NOT stop reading it, and I think I'm going to have to revisit the first two books, because I read them as they were released, and I'd like to go back and look for the connections. One thing I appreciate, and this is mildly spoilery, is that in the end, Roderick LaRoux isn't the BIG BADDIE. I mean, he's definitely bad, don't get me wrong, but the way the story ends adds some complex layers to his character, and I'm glad that they took the time to do that. It would've been easy to have him be a cartoonish, mustache-twirling villain with zero depth, but in the end, he does seem a lot more real. So yes. Read this book. Read this entire series. I think the characters are strong and complex, the action is heart-pounding, and the love stories are swoonworthy. Definitely a favorite.